Y’all, I have never once cooked with rhubarb before this recipe. 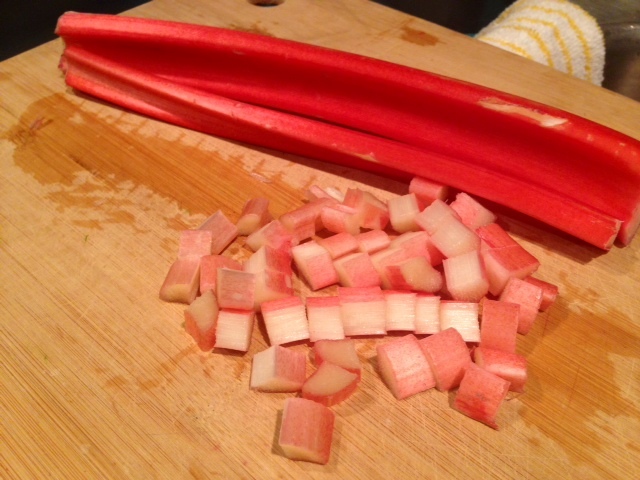 In fact, I could probably count the number of times I’ve had rhubarb on, like, half a hand. 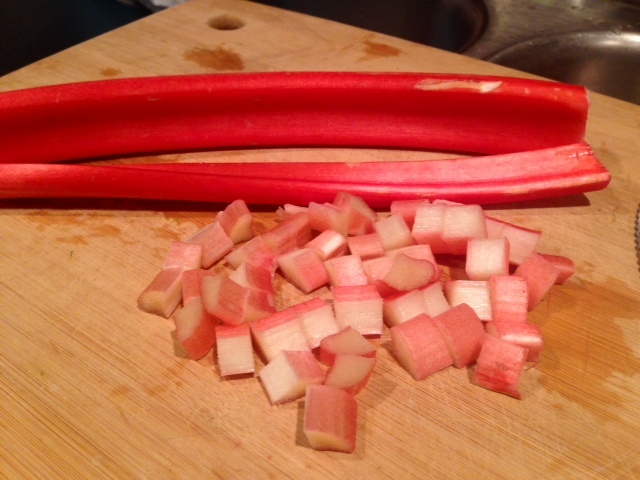 Which is creepy when you think about it (half a hand, that is, not rhubarb). 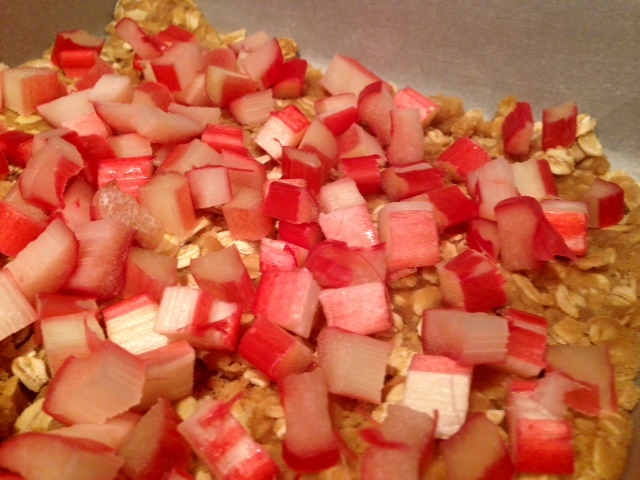 There’s something about rhubarb that screams spring…maybe it has a really short seasonality or something? I’m definitely not a rhubarb expert. 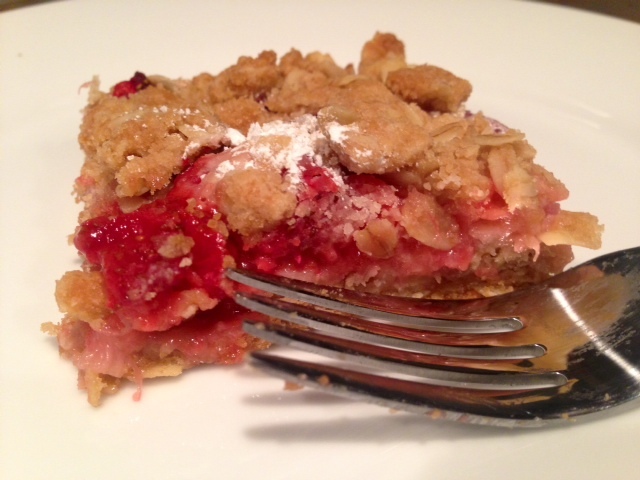 What I *do* know is that rhubarb is quiiiiiite tart, which is why it’s usually paired with very sweet fruits like strawberries, and takes a little extra sugar to make it edible. These bars look like a dessert (and they could be, with a few tweaks), but they’re really a healthy, fiber-ful, antioxidant-filled whole grain breakfast treat. 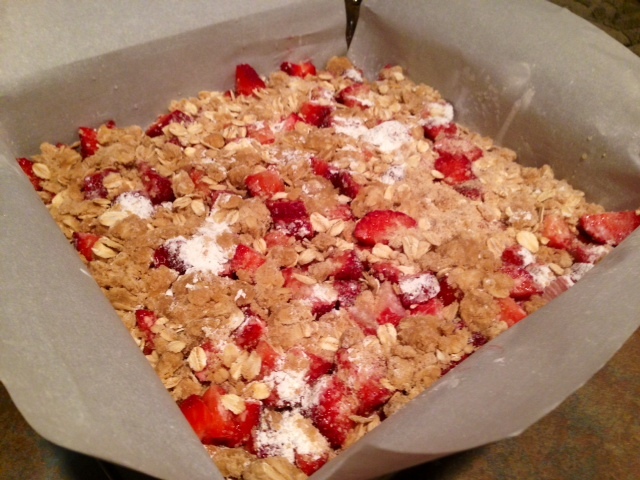 The star of these is obviously the strawberries and rhubarb (which is like a girly-looking, super tart celery), but the crust and crumble topping has a lovely light sweetness to it, made hearty by the oats and whole wheat flour. Heat the oven to 375 F. If you want to completely eliminate clean-up, line the bottom and sides of an 8×8-inch square baking pan with parchment paper. Otherwise, just grease the pan well. 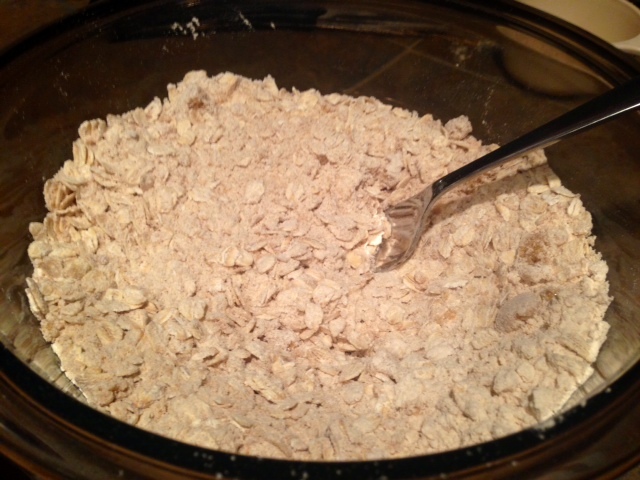 Pour the oats, flour, brown sugar, salt, and baking soda into the bottom of the pan and mix. I was afraid I couldn’t mix it that well in the pan, so I just did it in a bowl. Pour the melted butter in and stir until clumps form. 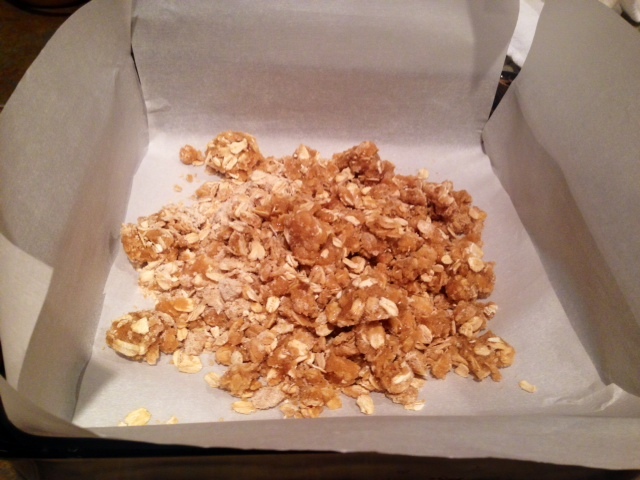 Set 1/2 cup of the crumble aside, and press the rest of the crumb mixture into the bottom of the pan to form a crust. 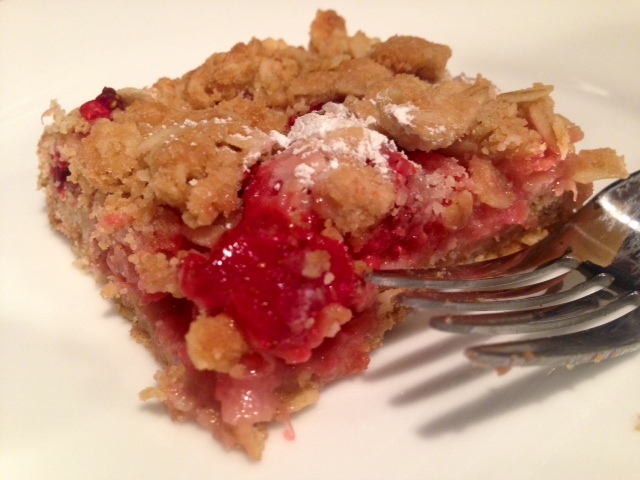 Chop up your rhubarb and strawberries (or whatever fruit you prefer) into small pieces and sprinkle evenly over the crust. Sprinkle the fruit with cornstarch, then lemon juice, and the granulated sugar. As I really was using this for healthy breakfast, I went pretty light on the sugar. 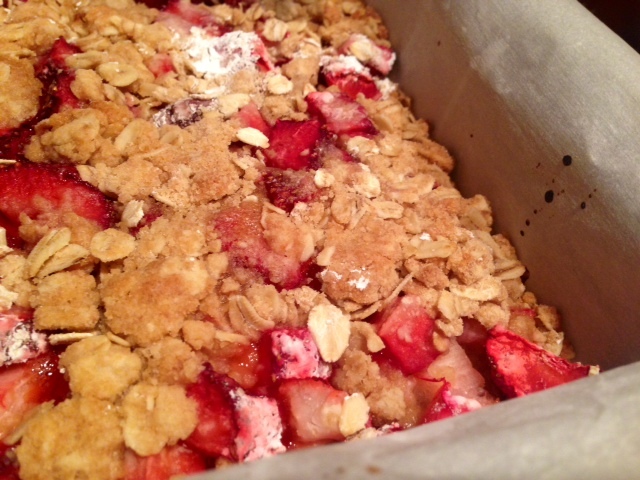 Scatter the remaining crumb topping over the fruit, pressing down a little. 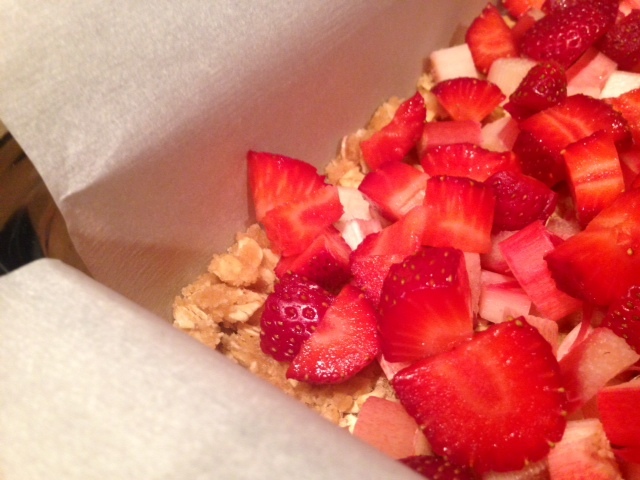 Bake for 30 to 40 minutes, until the fruit is bubbly and the topping is golden and toasty. Let the bars cool in pan before cutting. Leftovers can be stored in the fridge, but my coworkers didn’t leave a crumb behind! Heat the oven to 375 F. For easy removal, line the bottom and sides of an 8×8-inch square baking pan with parchment paper. Otherwise, grease the pan well. Pour the oats, flour, brown sugar, salt, and baking soda into the bottom of the pan and mix (alternatively, you can mix it up in a bowl first). Pour the melted butter in and stir until clumps form. 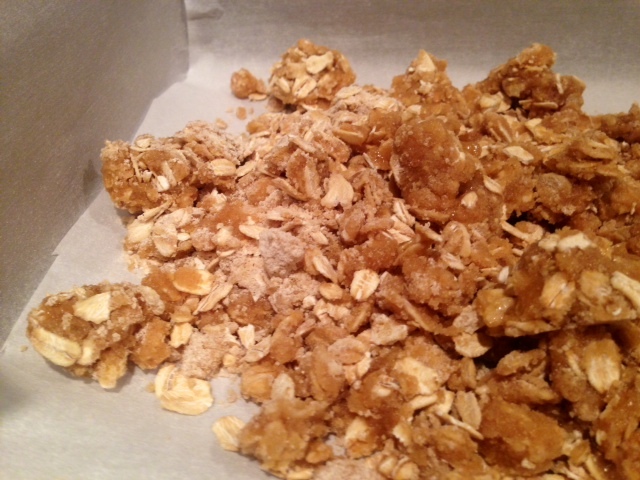 Set 1/2 cup of the crumble aside, and press the rest of the crumb mixture into the bottom of the pan to form a crust. Spread the fruit over the crust and sprinkle it with cornstarch, then lemon juice, and the granulated sugar. 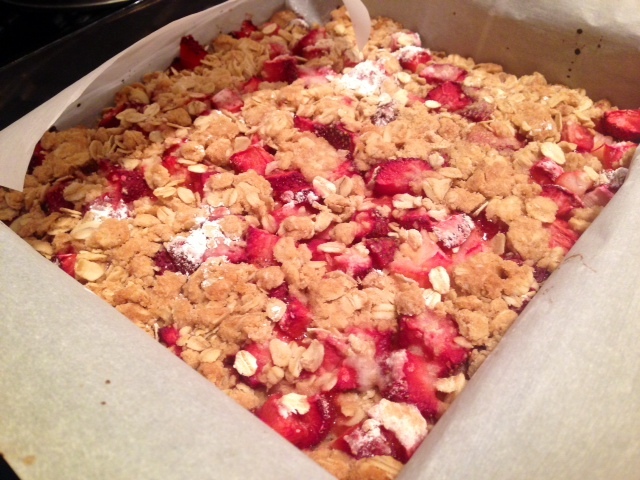 Scatter the remaining crumb topping over the fruit, then bake the bars for 30 to 40 minutes, until the fruit is bubbly and the topping is golden and toasty. 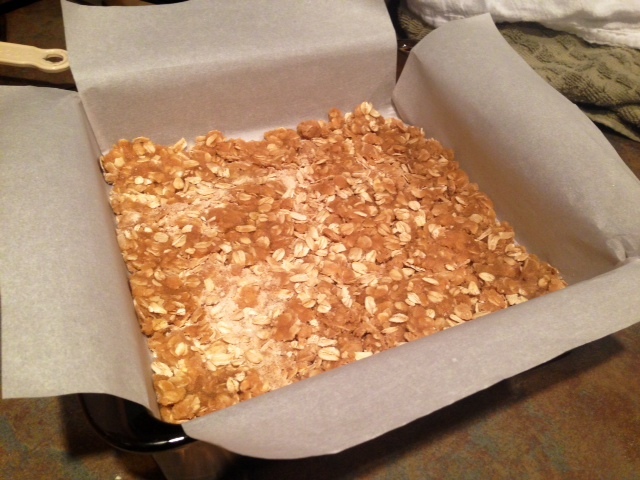 Let the bars cool in pan and cut into squares. Store leftovers in fridge.